If we want to reach a goal, we may need to develop or change habits. This book will help us understand how to do that. Parkinson’s disease directly affects as many as one million Americans, according to the Parkinson’s Disease Foundation. When you consider their families, friends, and colleagues, the number of people truly touched by this disease is remarkable. Whether you’re facing a Parkinson’s diagnosis or supporting someone living with the disease, education and community are key. Understanding the disease and what people living with Parkinson’s go through is a crucial first step in lending useful support. The following list of books is a perfect resource for those directly affected by the disease or even just those curious about it. There are a ton of great, FREE Parkinson’s print materials available – you just have to know where to look! This is by no means a complete list however these items are particularly useful. Fill in the order form with your information. If you do not want to receive emails from the DPF, make sure to check that box. Click submit and your download will be available. Need assistance or don’t have internet access? Email Alex Reinhardt at areinhardt@dpf.org or call 866-358-0285. Fill in the required information. If you do not want to receive emails from the PF, make sure to uncheck that box. Need assistance or don’t have internet access? Call 800-473-4636 to order. To download DIGITAL versions, select the booklet(s) or supplement(s) that you want to download. Once you do that, available publications will be displayed. Need assistance or don’t have internet access? Call 718-981-8001 x115 or email ECiorciari@apdaparkinson.org to order. online education, I would suggest the sources below. Please note that the webinars are archived on these sites so you do not have to view the webinar during it’s “live” broadcast. A practical step-by-step, room-by-room guide to simple modifications that can help seniors make their homes safer and easier to navigate, this reference offers readers clear and practical solutions. A new section of the website is being developed. The Book section will list books that people have found helpful. You can see the books so far here or by clicking the “Books” post category on the right or the “Books” menu item at the top of the page. Parkinson’s Disease, a disorder of the central nervous system, affects 1 million people in America and 10 million worldwide. 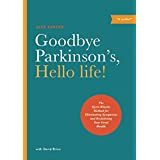 In Goodbye Parkinson’s, Hello Life! Alex Kerten presents his breakthrough holistic technique that combines dance therapy, behavior modification, and martial arts, to prove that there is life beyond the diagnosis of PD. Goodbye Parkinson’s, Hello life! received “Recommended Reading” status by the Michael J. Fox Foundation and listings on the National Parkinson’s Association social media sites. Parkinson’s disease affects all sides of you: your inside, your outside, and your “right” side—that is, the side where you feel positive, balanced, and beautiful. How do you find that edge when you’re not feeling very sharp at all? 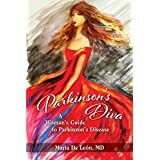 Parkinson’s Diva is a personal and professional accounting of a young Parkinson’s doctor’s experience with the disease in all realms of her life . . . from doctor, caregiver, and ultimately as a young Parkinson’s patient herself. – Diane G. Cook, Patient Representative Consultant, FDA; People with Parkinson’s Advisory Council, Parkinson’s Disease Foundation. Diagnosed with Parkinson’s disease almost two decades ago, Mary Huston relates how she confronted it in a straightforward manner, and refused to give up or play a passive role in her treatment and wellbeing. Her stories describing her long journey will have you laughing and crying at the same time. How does one deal with a diagnosis of Parkinson’s disease at the age of forty-three? 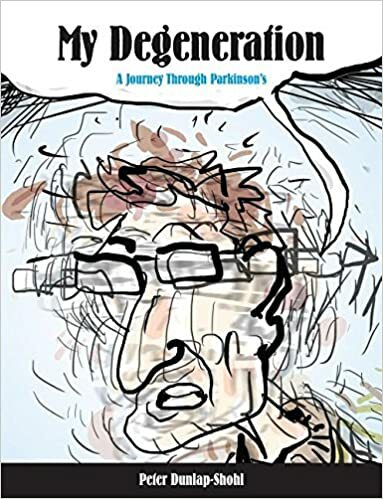 My Degeneration, by former Anchorage Daily News staff cartoonist Peter Dunlap-Shohl, answers the question with humor and passion, recounting the author’s attempt to come to grips with the “malicious whimsy” of this chronic, progressive, and disabling disease. This graphic novel tracks Dunlap-Shohl’s journey through depression, the worsening symptoms of the disease, the juggling of medications and their side effects, the impact on relations with family and community, and the raft of mental and physical changes wrought by the malady. My Degeneration examines the current state of Parkinson’s care, including doctor/patient relations and the repercussions of a disease that, among other things, impairs movement, can rob patients of their ability to speak or write, degrades sufferers’ ability to deal with complexity, and interferes with the sense of balance. Readers learn what it’s like to undergo a dramatic, demanding, and audacious bit of high-tech brain surgery that can mysteriously restore much of a patient’s control over symptoms. But My Degeneration is more than a Parkinson’s memoir. Dunlap-Shohl gives the person newly diagnosed with Parkinson’s disease the information necessary to cope with it on a day-to-day basis. He chronicles the changes that life with the disease can bring to the way one sees the world and the way one is seen by the wider community. Dunlap-Shohl imparts a realistic basis for hope—hope not only to carry on, but to enjoy a decent quality of life. David Zid, an ACE, APG certified trainer, has collaborated with orthopedic surgeon, Thomas H. Mallory, M.D., who is afflicted with Parkinson’s disease, and Jackie Russell, RN BSN CNOR, in the development of a Parkinson’s specific fitness program designed to proactively minimize tremors and improve flexibility, stability, balance and strength. This program empowers the person with Parkinson’s Disease to take control, helps with maintaining independence, and provides hope! Delay the Disease contains colorful photographs of Zid demonstrating each move, as well as recommendations for exercise frequency, modification and how to adjust the workout as one improves. Parkinson’s patients participating in Zid’s fitness program notice improvement in walking, dressing and maintaining balance. Exercises are divided into categories (wake up call, walking and balance, cardiovascular, strength, facial and vocal, and night-time stretching.